Similar to doing a walk-through of a hotel room right before you check out to make sure you have your toothbrush, it’s time to “walk through” your modular home plans one last time to make sure you’re not forgetting anything. It’s the job of the GC and Manufacturer to guide you through the modular home-building process, but you’re the one that has the responsibility to make sure that everything is how you want it. Double and triple check that you’re getting everything that you talked about because once the modular building process is under way, it can be extremely expensive to make any changes. Here’s a list of the most common oversights that a first time modular builder might make. First and foremost, if you’re working from a pre-existing plan and made some changes, make sure that all of the customizations that you want are addressed in the plans. Anything from repositioning a wall to changing the framing around your windows will need to be taken into account. This is a floor plan. It only shows walls, doors, closets, shelving, and major appliances. This may sound silly, but make sure that your house is facing the right direction. If you’ve added large south-facing windows to let in extra light during the winter, you probably want to make sure they’re facing south. Though extremely rare, this mistake usually isn’t noticed until the house starts to be set, meaning thousands of dollars lost in foundation costs and shipping the modules back to the factory until the new foundation can be prepared. The price is so extreme that it actually makes more sense to just have your house face the wrong way. Check to make sure that all your doors swing the right way. Make sure that you have the correct windows including style, framing, and type of glass. 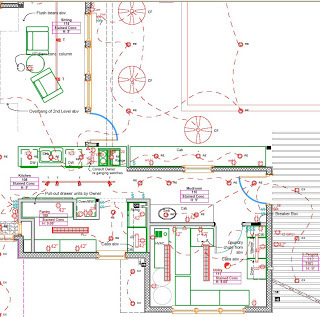 Notice that the electrical plan is much more detailed with wiring and light fixtures. You should even be able to see where the electrical outlets in your house are placed. Next take a look at your electrical plans. Do you have sufficient conveniently placed outlets? Make sure that if you’re installing specialty items like home entertainment systems or security alarms that you have the wiring necessary. Also often overlooked is any overhead wiring needed for recessed lighting, fire alarms, and carbon monoxide detectors. Make sure that your electrical panel box is in a place where it is easily accessible by the power company. If it’s not placed properly the first time, your power company can demand that it be relocated at your expense. This cost can be astronomical since it’s specialty work, so make sure that it’s done right the first time. This HVAC plan shows the return system, supply system, and vent placement in a home. Make sure that each room has at least one vent return and supply vent. Typically, these should be placed on opposite sides of the room to get the best air flow possible. Your HVAC system is one of the most likely aspects to get overlooked and it’s extremely important in modular homes. Make sure that you have vents in every room where you want one (probably in every room!) and don’t forget to add them to the bathroom. In the bathroom it’s usually a good idea to have a standard vent that’s controlled automatically along with the rest of the house, and a second vent that can be activated manually to prevent condensation buildup while a shower is running. Once again, consider breaking the HVAC system in your house up into zones. If your second floor is bedrooms and you don’t spend any time up there during the day, it shouldn’t be heated or cooled to the same temperature as the parts of the house that you’ll be spending time in during the day. Putting down the extra money for an automatic timer system can help keep your heating and cooling needs on a schedule so that you don’t even have to think about adjusting the temperature. As it is the responsibility of the manufacturer to ensure that the building meets state building codes, there’s not much chance that you’ll be falling short in that regard, but it is your responsibility to make sure that town and local building codes are met. Provide both your GC and your manufacturer with copies of all the regulations for building on your lot specifically and ask them to make sure you’re not breaking any rules.